The real estate market is filled with constant ups and downs. To survive in this competitive and aggressive atmosphere, you need to up your marketing game instantly. Smart, effective, and optimized marketing is the only way to stand out beside an efficient real estate portal development. Not only will efficient marketing helps you grow your client list, but also build an impressive portfolio of profitable and desirable properties. 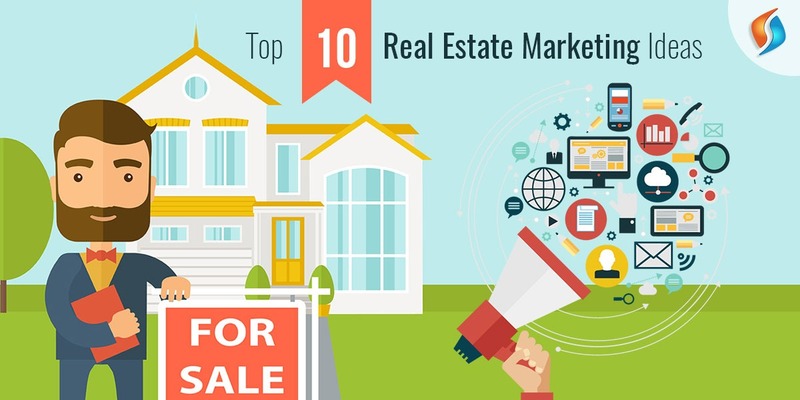 So, here are top 10 real estate marketing ideas that you need to implement promptly! Most real estate listings are just an objective, fact-based list of all their features. While necessary, these features do not portray its experiences, vibes, or any emotional value. People love to buy a property that has an emotional and compelling story. Yes, the facts and features need to be showcased but in addition to that, you need to find out its history and let it cast its magic. In this age of digital marketing services, one cannot market proficiently without taking the opportunity that social media avails. Interaction on social platforms and specific groups is a great way to boost your brand name and gain new clients. Posting listings will help those in the market to buy a home, but what about those who don’t want to buy one now? Just because they cannot buy one now doesn’t mean they are not interested or not planning to buy a house in the recent future. Post-value-rich content that can engage such potential clients and help you in the future. One of the most critical rules to market efficiently is to offer valuable and accurate information on your listings. It is crucial to share and market property management solutions that are valuable and shows the current condition of the property. Offering outdated or inaccurate information about your marketing activities will affect your brand name as a whole. Building a Google business page is the ultimate way to interact with your clients. You can add all the necessary information, contact details, availability, and more so that the clients can gain all such knowledge in one go. Furthermore, it is an excellent place for them to leave reviews which will play an essential part in getting more clients. A blurry, grainy, and low-quality picture will not only exhibit a wrong impression of the house, but will also negate any chances of you impressing the client. You need a high-quality professional photograph that portrays all your claims. The pictures should be attractive, enticing, and hard to ignore. There are instances when the client does not have the time to visit the property, and you do not want to miss your chance because of this hindrance. A virtual tour is a great way provided by AI services to give an accurate and real tour of the house without wasting their time. Video a virtual tour in natural lighting for your potential clients and give them a lasting impression. Blogs and Vlogs are all in rage right now, and you do not want to miss this opportunity. Develop detailed blogs or vlogs on the history, style, and features of the property. Highlighting the surrounding area, availability of markets, restaurants, shopping malls, and such is equally essential. The best and the most effective way to target your local buyers is to optimize and geo-tag your website with custom web development. Utilize smart and effective SEO tactics along with keywords focused on the location for best results. Yes, not everyone buys more than one or two houses in their lifetime. But it does not mean you should forget your previous customers. Send email newsletters or simple follow-ups. You need to stay fresh in their mind in case their friend or family requires a real-estate agent. Utilize these proficient marketing ideas to grow and nurture your real estate business beside an efficient real estate portal development. Hire the best Real Estate Portal Development Company! Are you looking to make it big in the real estate market? Why stick to old school gimmicks, when you can jump ahead with real estate portal development from Signity. Hire our outsourcing team of experts.Contact us at info@signitysolutions.com, and we will provide you with all the assistance you need.